Some insects’ mouth-to-mouth exchanges transmit tiny molecules of hormones and other important chemical information, according to scientists writing in the journal eLife. The spit-swapping behavior is called trophallaxis. Many entomologists who witnessed the behavior in ants and other social insects believed the bugs were using it to efficiently share food. But some researchers noticed that carpenter ants were trophallax-ing in non-dining contexts, like when one ant would return to its family after being away. The scientists wondered if the ants’ kissing juice contained more than just calories. They brought lots of ants into the lab to sample what the ants were sharing. At first, the researchers tried just waiting around until one ant initiated trophallaxis, but that mostly resulted in a lot of waiting and very little fluid. Eventually, they figured out that they could gently squeeze the ants’ bellies until the liquid came dribbling out of their mouths. The researchers ran chemical and genetic tests on the fluid to determine its contents, and they found all kinds of interesting things. The liquid did indeed include particles of food and digestive enzymes, but it also contained several growth-related proteins and a juvenile hormone that can influence an insect’s development. 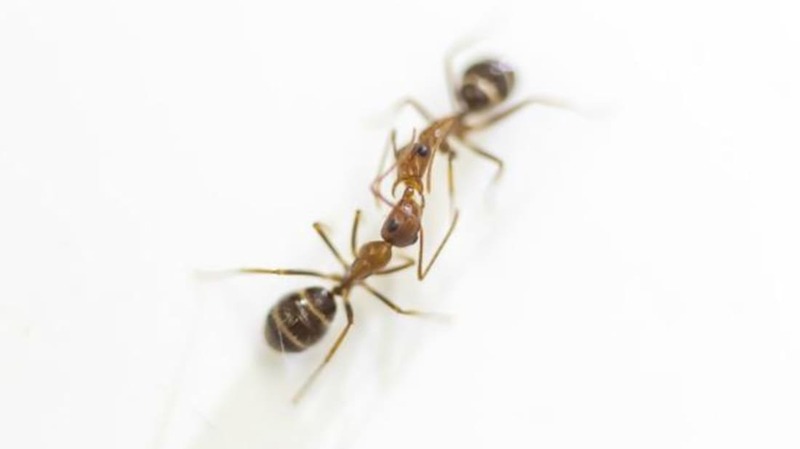 To find out how these compounds might affect a trophallaxis recipient, the researchers added the juvenile hormone to the meals they were feeding adult ants. The adults passed the hormone-charged liquid onto their larvae. The larvae loved it. Individuals who had taken in the hormone were twice as likely as others to survive to adulthood. First author Adria LeBoeuf works at the Center for Integrative Genomics in Switzerland. She says the ants could very well be using trophallaxis to decide which larvae succeed. “When the ants feed their larvae, they aren’t just feeding them food, they are casting quantitative ballots for their colony, administering different amounts of growth-promoting components to influence the next generation,” she said in a statement. Larvae chosen to receive the liquid are being nourished in more ways than one. In some ways, LeBoeuf says, it’s a lot like mammals’ milk. It also suggests that “…the oral exchange of fluids, such as saliva, in other animals might also serve previously unexpected roles." Yum.